The rapid rise of mobile phone networks, and the reducing cost of mobile technology, has made alternative delivery channels (ADC) a cost-effective way for financial insitutions to increase their outreach and improve their efficiency while working in the field. Our Mobile Banking and Internet Banking modules link directly to Abacus, providing secure and real-time access to customers. Credit Union, MFI or bank customers can look at balances; review transactions going back 90 days; print a statement by date range; pay bills online; and transfer money between accounts. Login to Internet Banking, and download of the Mobile Banking app, can be via your own website for a consistent user experience. 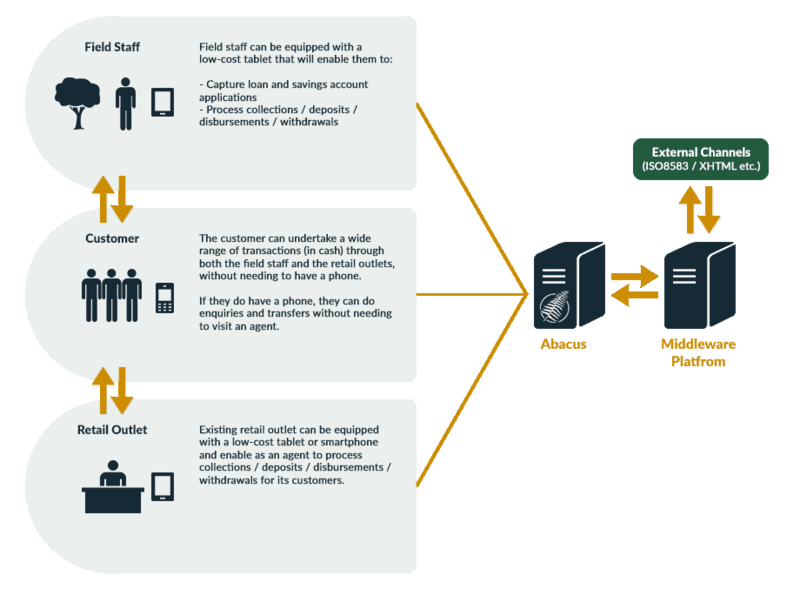 Fern’s solutions also support easy ADC integration: our open database design and inbuilt APIs let you connect to established mobile money services; plug into ATM networks; and equip your field staff or agents with tablet devices that can be used even when there is no mobile network. When combined with our ability to work in a hosted, centralised or decentralised environment, increasing outreach doesn’t mean complex infrastructure requirements.